The Big Nuke (2.8" airframe) is a super flyer. 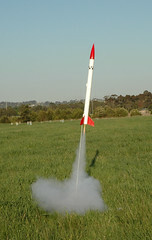 One of my biggest scratch-built rockets so far. I'll get around to fixing it some time - it's too good not to try! !